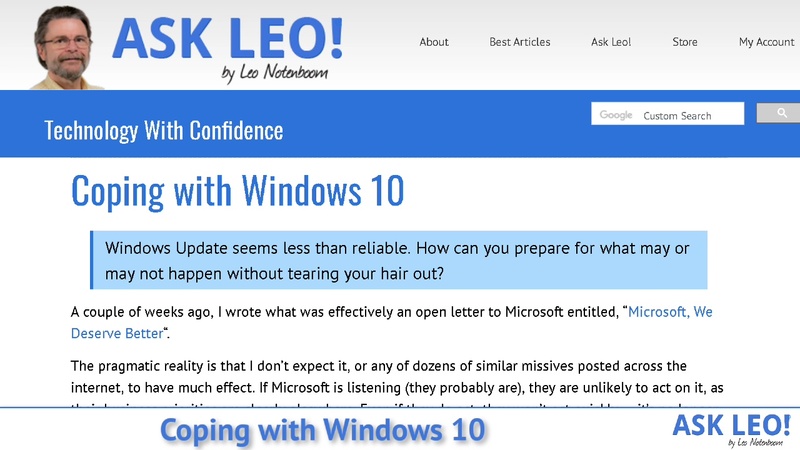 Coping with Windows 10 - Ask Leo! The pragmatic reality is that I don’t expect it, or any of dozens of similar missives posted across the internet, to have much effect. If Microsoft is listening (they probably are), they are unlikely to act on it, as their business priorities are clearly elsewhere. Even if they do act, they won’t act quickly — it’s no longer in their nature. Act as if the gun is always loaded. Know what’s in your control and what’s not. Try to sidestep the frustration. One of the first rules of firearm safety is that you always act as if a gun is loaded. Above all, you never assume that it is not. 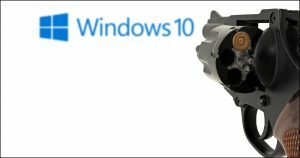 In my missive to Microsoft, I alluded to Windows 10 Updates being similar to playing Russian Roulette. The same rule applies: whenever you’re about to take a Windows Update, assume that the gun is loaded and it’s your machine’s turn to get shot. Do what you can to take the updates at a time under your control. That might mean deferring updates, if your edition of Window 10 supports that, or it might mean proactively checking for updates on your own schedule, when you know that a failure wouldn’t be more than a (possibly large) inconvenience. Back up. In fact, back up more than you think you need to. Create an image backup daily. Then create another just before you take updates, if you can. Back up your data separately — automatically, even — to the cloud or some other safe location from which you can recover the data should something go horribly wrong. These are things that we should all be doing anyway, especially the backing-up part, but it’s clear that these two steps have become significantly more important given Windows 10’s recent update history. Unfortunately, I often hear from people complaining about Windows 10 updates even though they’ve never experienced a problem. Instead, they’re reacting to the headlines. Headlines are written to be sensationalistic. They’re written to get you to click. They’re written in such a way to make minor issues seem major and make inconveniences seem like disasters. In other words, headlines lie. While Windows Update does have its problems, it’s not affecting nearly as many people as the headlines imply. The same applies to comments on articles like my letter to Microsoft: the people most motivated to participate are those who’ve experienced a problem, no matter how few of them there might be. The fact that the vast majority of people are not experiencing a problem goes unreported. Again, I’m not saying there’s no problem. Windows 10 updates have problems, without a doubt. It’s just not as likely to affect you, specifically, as all the headlines lead you to believe. One of the frustrations Windows 10 users experience is a lack of control. Windows updates seem to happen on schedules we ultimately have no say about. Indeed, it’s one of my pleas to Microsoft that complete control be returned to the user. But that doesn’t mean you have no control whatsoever. There are hacks with varying degrees of success to turn off Windows Update. I have one: How Do I Disable Windows Updates in Windows 10 Home? This might also be used to disable finer-grained updates in other editions of Windows not explicitly controlled by the “defer major updates” settings referred to in the previous point. Another point of control is to look at updates a little differently. Rather than letting Windows itself choose when to download and install updates, do so more proactively on your own schedule. When you have time, and could have the time to deal with a potential failure, manually check for updates and take them. The only caveat is that you’ll want to do so often, so as to have it happen before Windows own random schedule kicks in. Reverting to Windows 7. It’s still under “extended support” for security issues, at least until 2020. Switching to Linux. This is a major commitment, and something to be well investigated before you do so. It’s something you should be able run on your current hardware, though most of your current software will not work. The good news is that there are typically free equivalent replacements. The bad news is that they’re sometimes different enough to not really be a solution for some. Hence the research. Switching to Mac. This is actually a more major commitment, since it’ll require new hardware. But Macs seem to be a more stable ecosystem over all, since they don’t have to deal with the infinite variety of hardware configurations Windows must. The bad news, of course, is that the hardware you want may not work with your Mac. Switching to a Chromebook. If your needs are simple and mostly web-based, Chromebooks are actually a very viable and secure alternative. You’ll need new hardware, though it’ll likely be cheaper than a Mac, and your old Windows software will also not work, requiring that you get Chromebook-based equivalent replacements if they exist. Honestly, I’m not seeing a lot of people take this option. Most, having made it to Windows 10, are opting to stick it out. And let’s face it: as I mentioned above, most aren’t having a problem to begin with. I totally get that it’s frustrating to have to deal with this. Things should just work. Microsoft should do better. Unfortunately, “should” helps no one. The reality is, we have what we have, and getting angry or frustrated over how it does or doesn’t meet our expectations is just energy wasted. It helps no one, and only raises our blood pressure and decreases our life expectancy. There are more important things to life than railing about how messed up things seem. Use the control you have to take the actions listed above. If something bad happens, you’ll be as prepared as you can be. Instead, be thankful you have that backup to restore from. Things could have been so much worse without it. 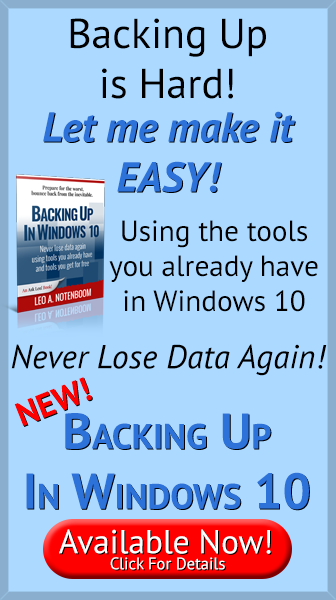 Critical: Back Up Before the 1809 Windows 10 Update! - The October 2018 Windows 10 Update is apparently deleting some people's files. Here's how to prepare and protect yourself. I really like Win 10 and have had zero (0) problems with the platform on the three (3) devices that I maintain in my home environment; a 32-bit 2-in-one, a 64-bit HP i5 4-core 8GB desktop with 2-1 TB drives on board and a laptop with 64-bit i7 8th Gen 4 core 8GB with a 1 TB drive. I use EaseUS Free to do a nightly backup on all the devices with a 5-image retention scheme. I have yet to resort to a backup image to fix an update issue, knock on wood. But if I ever have to, I feel assured that the problem will be quickly resolved. Also, I have all my devices configured for the “Semi-annual” upgrade package. Not “Semi-annual targeted.” These settings delay feature upgrades for a couple of months while the beta-testers work out the problems with MS. For example, all of my devices didn’t upgrade to version 1803 until June 2018. No muss, no fuss. Win 10 is definitely more challenging than previous MS OSes, but that’s the kind of thing that makes me feel alive. Also, all of my personal data is backed up not only to Dropbox but to an external drive attached to each of my computers. That’s just it. For home, no problems for the most part. So for home, I have also had no problems. On a domain, garbage. Leo, my wife and I each use Win7. I’m giving her a Win10 laptop for Xmas. Is there some reference you know of that will summarize all the things I’ll need to know and do to get her up and running? Not that I’m aware of, really. There are various books and such, but the problem is Win 10 keeps changing, so the details quickly begin to differ. Leo did have a couple of articles about configuring Windows 10, such as local account login vs OneDrive login and privacy settings. I think there may have been three or four articles. You might want to search the archives here. Richard, maybe you should back up the Windows 10 gift with some diamond earrings, just in case. Excellent article! Only wish more info was provided regarding making the changes to updates, i.e., steps on how to get to which page/screen and which items should be turned on or off. requiring that you get Chromebook-based equivalent replacements if they exist. And all of the programs that run on a Chrome Book, except a few pre-installed programs, are web-based programs, so you have the opportunity to check all of those out on the web before you switch. Depending on the device, many Android apps will run as well. I’ve got several installed on my low-end ChromeBook and it’s kinda handy. But that’s another source of possible replacement apps. I cope with Windows 10 by ignoring it. Actually, I have fired Microsoft. Since Windows 10 bricked my computer in 2015, Microsoft no longer exists. I have Windows 10 Home on my main laptop computer but have yet to download and install the recent Fall Update. Still waiting to find out if it is totally secure and bug free. I have the System Update set to Manual so I can at least get Defender updated. On a desktop I run Linux Mint, on a 2-in-1 (former Windows 10 which messed up my touch screen and trackpad) I run Linux Mint and the touch screen and trackpad again work perfectly, I have a Chromebook which I gave up on due to Google’s situations, an iPad, and an Android phone. If and when Apple manufactures there own CPU for the iMac, I will dump Windows 10 and buy an iMac. If I could get my ProShow Gold slide show program to run on Linux, I would completely go with Linux as my main computer for all tasks. Besides getting Windows programs to effectively run on Linux, I am still learning about the file system structure. I get along without “using” it; but I just like to know as much as I can about things. “Beginner’ books about Linux don’t really address the file system and/or compare it to Windows for an understanding. RE: Linux, a major caveat is that getting help can be a problem. I have toyed with Linux and found that when people answer questions they ALWAYS assume you have knowledge that you quite likely do not. They will assume that you know where to go to download missing software and will tell you that in order to accomplish “x” you simply do “a”, “b”, and “c” without explaining how to do “a”, “b” or “c”. As more and more people are using Linux, hopefully, there will be more resources available for the average user. Perhaps someone here can recommend some good Linux support groups for the 99%. From my experience, when I get information that tells me to do a,b, and c and I don’t know how to do a, b, and c, I Google a, b, and c. But I agree, that’s a lot for someone who just wants their computer to work. Abhishek Prakash (and his team) from itsfoss.com is kind of the Linux equivalent of AskLeo! They have recently started a community forum (https://itsfoss.community/) for Q&A. Also try https://www.linuxquestions.org, and unix/linux stackexchange: https://unix.stackexchange.com/, as well as any Q&A forum associated with your specific Distro. Seriously, though – just Google your question. Some of the communities have the reputation for being pretty technical and snobby, but most really are not: they are becoming really friendly and helpful places that want to encourage users to Linux, not scare them away. Whatever your question, odds are it has already been answered somewhere anyway, and a search will easily lead you to it. Start with a really user-friendly one, like Ubuntu or Mint: they’re pretty straightforward, and if you do encounter problems, there are tons of resources to help. I’ve been a Linux user for many years, not a power user, just a regular user like 95% of people at home. I had no problem switching over, whatsoever. If you know anything at all about Win-7, there are Linux distros that are much like Win-7, only better. I played with Win-7 and Linux for a while, until M$ killed all my Win-7 computers. This seemed to correspond with M$ pushing Win-10 on me, regardless of whether I wanted it, or not. I’m now done with Windows, except to help other people with theirs. (Ubuntu went the way of Win-10 with their Unity desktop–full of icons–cluttered, and a major change from the old M$ standard desktop. Ubuntu went down the drain, but I found Linux Mint, and stayed with it ever since, through several generations of Mint. Still love it, especially for a newby from Windows. I found Linux support with Mint to be excellent. There are the Forums, the Community, the Help Book, or manual, and the IRC Chat messenger. I never needed much help, but there are YouTube videos for Mint, too. I highly recommend Mint, and stay away from the corporate operating systems that want to control your computer on you/for you. It’s my machine, and I’ll do what I want with it, not you. With a little experience, most people will learn how to customize Mint to their liking–and it stays just the way I chose, it doesn’t suddenly revert to something different. My recommendation to a Windows convert, would be Mint 18.3———and you’ll learn to love it like I did. I installed Linux Mint on a few people’s older computers which were running XP. They had no trouble adapting. It seems like the learning curve from XP to Linux Mint is lower than from XP to Windows Vista or higher. I went to the Mint home page to download a copy, and saw that 18.3 has been superseded by 19. As an old time computer geek… IBM 1620, 1130, 1401, DEC, Data General, 8080, Z80, 8086, MSDOS since 1.0, windows since 2.11, but linux virgin should I go with 18.3 or 19? and with Cinnamon, KDE, MATE or Xfce? And I really dislike Office after 2003… is there a decent Office clone that can mimic the 2003 UI? Libre Office isn’t perfect, but it’s interface was loosely modeled after Office 2003 and is more similar to Office 2003 than later versions of Office. I started using Libre Office as my main office program when my subscription to Office ran out with plans to eventually resubscribe. It’s been 6 months now and I see no reason to pay for Office. I second LibreOffice. Also, Mint (though you can change out the Ubuntu Unity desktop). And Mike: probably just pick one and go for it. There are almost as many opinions out there as there are users. If you’re limited on hardware resources, go for one of the last 3, but if you have the hardware and like something flashier, go for Cinnamon. If you don’t like it, or want to experiment, you can always change out the DE later, independent of the OS. Frustration, Leo – I went to purchase your ebook. It asked me for the coupon code. I had no idea where to find it. Was it to the left of the APPY COUPON CODE? I would really like to get this book so please help me out here. Where is the coupon code? The coupon code field is for when you get a coupon code from some offer made somewhere else. For example the most common one is that there’s a coupon code at the bottom of every emailed newsletter for 20% off. Without the coupon code you simply pay full price. About ten years ago I switched from Microsoft to Apple. I’m not a rabid Mac person, or Microsoft hater, but I just like the Mac OS. I admire your site. I have to take exception to Macintosh being a strong alternative to Win10. I have used Mac’s since the days of the Plus. I find their recent annual “updates” to the OS demonstrating a complete lack of adult supervision in comporate management. Commitment to Mac is equivalent to a commitment to let Apple pick your pocket. Every yearly OS change seems to break nearly all the prior software requiring the purchase of all new upgrades. The OS updates are incompatible with perfectly usable older hardware forcing repeated unnecessary hardware upgrades at considerable extra expense due to the Apple hardware pricing penalty. I just don’t have these problems with Windows to anywhere near the same extent. I minimize my Mac use as much as I can – I do my real work under Windows on a native Windows machine. Most everyone in my circle of friends have also abandoned running Windows on Mac – not worth the bother and the expense. I’ve been running a Mac for at least five years (in addition to my PCs), and my experience doesn’t match yours. The software I have just keeps working through all the updates in the intervening time. 1. Use well supported hardware. I work with Dell, Lenovo, and Mototola, with nary an issue. When that custom built unit from your neighbor’s favorite compute shop has an issue, it doesn’t mean that it was Microsoft who failed you. 2. Check that the applications you chose are rated to operate on at least Win7 or later. The logic here is similar to 1 above. 3. Don’t hook weird hardware peripherals to any computer that is important to you. Weird peripherals come with weird software drivers, which probably were hacked together on a minimal budget, in a rush, to get that product out the door. If all this sounds familiar – think Apple. Part of their reputation was earned by forcing customers to use only their hardware, to use applications they vet, and to lock out dodgy peripherals. Enjoy. I stuck with Win 7. Had one or two probs with auto update so now only apply vulnerability fixes. I backup often! I have a big investment net in vba. Being forced to migrate to win 10 fills me with dread! I fix pc’s for friends and friends of friends – I have been using pc’s since before Dos. I have used every variation of windows since it first was available. XP was an eye opener for how good it was. Forget Vista, 7, I always considered as XP with an additional very good service pack. The least said about 8 the better. With regards to 10 in my view mainly 7 with a very good additional service pack. It is certainly the most stable OS that MS have ever produced. I have had no problems with it and those machines with a problem have been very easy to sort out and get running properly. Windows 10 has certainly made life easier for me, an old pensioner, fixing other peoples equipment. Some of those complaining should be told how bad things were before windows. My first printer had 24 DIP switches that had to be set to produce any print out. Love your column. I winter in south Texas and find little help available. Have new I pad and I ph and hp wireless printer that I can air print but some times want to print with Dell laptop offline but need a source to tell me what setting I need to do to make it happen ? If the Dell is offline it can’t print to a wireless printer. You need some kind of network connectivity. I generally don’t have much of a problem with W10 but am continually frustrated by the updates. Whenever an update requires a restart my PC hangs up, showing just a black screen with the LENOVO logo. My only recourse is to unplug the PC and restart by switching it back on, then I wait whilst it completes the alterations and gets my PC ready. I know you advise against ‘crashing’ the power but having previously left it to its own devices for over 24hrs it does appear to be the only solution. Incidentally there is nothing in the CD/DVD tray and no external drives attached so I’m pretty sure it’s not trying to reboot from anything other than the C drive. Leo suggests one alternative to Windows 10 as, “Reverting to Windows 7. It’s still under “extended support” for security issues, at least until 2020.” Little known secret: so is XP! Through April of 2019. Via what are called POSReady and WePOS updates, which XP users can obtain via a registry hack. And, yes, I still have XP machines — in addition to Windows 7 and Windows 10 machines. On one of my XP machines I had stopped POSReady/WePOS updates back in 2016. Last week I re-enabled Windows updates on that machine and got 95 POSReady/WePOS updates downloaded and installed. And this high-end septuagenarian also uses Linux daily at work (SuSE, RHEL, Ubuntu). The best ever OS in my humble opinion? XP. Suit yourself. But remember that the Model T was the best vehicle of its time. In its time. But I don’t see people driving them today. Because they don’t meet today’s needs. At one point I was going to stick to Windows 95. But 98 was better, especially 98 SE. I used XP for a long time, but Win 7 was better. I used Win 8 and it was okay, but not spectacular. Win 10 is great. Its man-made so it has the occasional problem, but they aren’t insurmountable. In a perfect world, I’d expect some changes, but we’re not in a perfect world, so we use what we’ve got. I play around with Linux and I might even go to dual booting with it. But my printer doesn’t work with it, and I can’t afford a new one. I also used a MacBook Pro for a year or so. It didn’t do for me what I thought it might but I still enjoyed getting to learn the ecosystem. Like I said, suit yourself. if you want to drive a Studebaker while the rest of the world goes to a Tesla that’s fine. I knew a man who drove a Studebaker for fifty years. It outlasted him, and he was happy with it. That doesn’t bother me. What does bother me is people telling me that I’m a dunce for enjoying the challenge of new things. I just came across a summary of a Techspot article on slashdot.org that offers more information about the updates users might find. Yep. Personally I find that a little frustrating — almost a penalization of those who are trying to manage their updates themselves. After getting rid of my Radio Shack TRS-80 I bought a second hand PC from a guy at Waffle House with Win 3.1 on it. Well, it worked better than the TRS-80, although I did have to warm up a corner of the tube style monitor with a hair drier because of some loose connection on the circuit board that made contact only when the system was warm. Since then, it’s been a cork tossed into a river kind of ride with computers. Tried ’em all, Macs. Linux (good way to get hacked, really quickly in my case) back to Windows. So, we just flow along, trying to avoid the rocks and snags of the digital river. I see many complaints about Windows 10 problems. So many of those people singing the praises of XP. XP was an excellent stable OS but it wasn’t always so. I remember holding off on using it for about a year until it was updated into the stable system it eventually became. The problem isn’t necessarily Windows 10. It’s more of an early adopters’ problem. I call first releases “Gamma testing” versions. Microsoft now has Updates B,C and D. Each letter represents the weeks of the month. Only Update in the second week which will be “B”. C, and D updates are beta updates and not recommended. They also now don’t recommend checking for updates manually. If that is the case then the check for updates should be greyed out once the monthly updates are installed. After a Windows update, I can no longer run PC super shield, if I keep it on I cannot connect to the internet with internet explorer. You’ll want to contact the manufacturer of that software for assistance. Just my two cents’ worth. Despite all the snafu and glitches with Windows Updates, Windows 10 is the best OS ever. And as you often mention, Leo, it is there to stay. Right now, as of this writing, my two PCs are like on steroids and running really smooth (knock on wood). Besides, what a better way to learn than to have to search for solutions to your computer problems. As you emphatically said in your article, the hype of theses hyperbolically inclined headlines never mention those without any problem at all and the percentage of the latter is way higher than those with problems. Lastly, I have again to reiterate my thanks to you (your newsletters) for guiding me into always backing up on a daily basis. Last Sunday, I did the latest update for 10 and after a reboot I couldn’t open any page and a 0x8027025b code came up every time. I ask for Microsoft chat help and that person didn’t help much. The next day I ask again and this person helped but now I have to use internet explorer instead of edge and some windows don’t work as well. Is this common and could I download another browser to use? You can absolutely download another browser — I recommend Google Chrome. Is it common? I don’t believe so. But clearly it does and can happen. I ran the microsoft updates from oct 2018 and after the updates were done my computer went crazy i can’t do anything at all it won’t let me go online it just freezes and goes to blue screen I can’t do anything to reverse the updates. Is there something i can do to fix this problem? Great article, but I would encourage Leo and all IT journalists to keep up the pressure on MS to change its update policy on W10. We shouldn’t just accept that MS won’t change. And MS must eventually realise that its erstwhile customers are leaving their orbit because they’ve had an entirely avoidable problem with their OS. I have had update problems on two laptops, one of which required reinstallation from scratch. I know what I am doing, but most people don’t. For them, this laptop would have been ditched, along with the OS. Needless to say, perhaps, my two desktops are going to stick with W7 until its dying breath. I agree completely. That’s why I wrote Microsoft, We Deserve Better. A simple solution to defer major updates to Windows 10 is set your home network to “metered” so only critical updates apply automatically. In my experiences, it seems that the majority of people having issues with Windows 10 are the ones who upgraded their older hardware from Windows 7 or 8 when Microsoft was allowing people to upgrade for free. I think that if your hardware is “designed for Windows 7”, you’re rolling the dice on your Windows 10 experience. Also, to the point about Chromebooks, you don’t necessarily need to buy new hardware. There is another option called Neverware CloudReady that gives you the ability to install their version Chromium OS onto most any laptop or desktop, essentially turning your device into a Chromebook. They offer a free version for home users. not get my mail program (Telus Webmail) to load. Finally was advised to switch to Chrome instead of Edge, and Voila!! got my email working again! Will Microsoft smarten up one of these days, please!!!….Les…. I’m glad to see you recommending Chrome browser. Does it work as well on Windows as on a Chromebook: i.e., much faster than other browsers and update automatically in the background? I run a technologically simple but content-rich website (http://www.responsibleconsumer.net) and use a Chromebook for everything. I really appreciate the time saved by automatic updates in the background to both browser and operating system plus never worrying about getting malware. You don’t use WordPress “ON” the Chromebook — you install it on your website’s hosting provider. You then manage it by viewed admin pages in your browser. Any browser, on any platform.